Listen to Dennis Binder on "Early Times," "I Miss You So," "Long Man Blues." 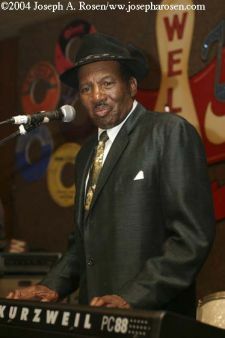 Ike Turner's Kings of Rhythm had their share of powerhouse vocalists in the early '50s, beginning with Jackie Brenston—whose 1951 "Rocket 88" has often been referred to as the very first rock 'n' roll record—but the name Dennis Binder has long stirred magic amongst devotees of the finest early gut-bucket rock 'n' roll. Binder points out that he was never actually a member of Ike's band, though some his finest sides, namely "Early Times,' "Nobody Wants Me," "She's Somethin' Else" and "You've Got Me Way Down Here," feature Ike's scintillating guitar leads and the Kings Of Rhythm blasting away behind him. "I took my band down to Clarksdale to challenge Ike's band to a duel," says the Mississippi piano pounder. "And then I would up recording with them." Turner knew talent when he saw it, and after cutting the session, sent the masters to Los Angeles's Modern/ RPM imprint who issued them under the Kings Of Rhythm moniker. Dennis's next stop was Chicago where he laid down the legendary "Long Man Blues" for the United label before recording a bizarre version of "Crawdad Hole" with Buddy Holly in Texas and settling in Oklahoma where he continues to reside today. At 88 years of age, he's still known for dressing to the nines and turning in sets brimming with fiery youthful exuberance, as he's proven at three past Ponderosa Stomp appearances. This year, he'll play the New Orleans Jazz and Heritage Festival for the first time, making a very special appearance at the Hi-Ho Lounge on Friday evening with Guitar Lightnin' Lee and Little Freddie King. Binder will open the show with a full set of his early '50s sides—and related favorites like "Rocket 88" and Roscoe Gordon's "No More Doggin'"—backed by his Stomp band, the Early Times, an R&B offshoot of the Haunted Hearts featuring Iguanas' tenor man Derek Huston on horn and other notable New Orleans players.